The old thread has got a bit full. Here's a shiny new one! Isn't it customary under these circumstances to post a link to the old, retired thread? Thank you very much Captain. I'm running off my iPod for a while so I find it a bit more difficult to carry out such things. Again, thank you. Lets get this party going! I'm working on my first corset, and instead of using one of the multisize commercial patterns, I'm using an unpublished pattern from the 1890s. It's interesting, because it was never published-- it's out of a corset house's pattern book. One size only, hardly any markings. I've got a suggested flossing pattern and boning placement, but that's it-- no grainline, no scale, no waistline. There will be many mockups, I think. I've got a halfsize paper version at the moment. Avatar made with much assistance from Ammotu's artistic talents. Quite an undertaking there, Mistress Magpie! I like the shape of the pattern, and will be interested to see the forthcoming results. 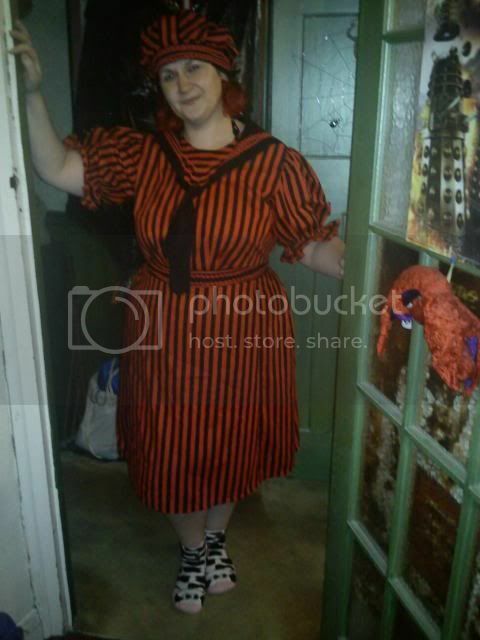 Polaris, I loved your striped dress from the last thread! It is a true work of art, well done; makes me want to put together a black-and-white striped outfit myself. After commissioning a fab fur Pill Box hat and Muff from Dragonswann I really must get the rest of the outfit done in time for all the Christmas markets we are going to try and attend. Outfit will be based on Truly Victorian patterns with a bit of modding. Made in some nice brown wool with a velvet stripe and silk. Lets hope the picture in my head is as good as the finished outfit. You will will be the judges. Oh and I have some fab new boots as well. so no excuses now. Now gathering supplies to make my outfit for next February's Gala Nocturna ball in Antwerp. The theme for this is "Russian Fairytale" but I'd already had a plan in mind to make the Truly Victorian Parisian Trained skirt, adorned with real beetlewings. I think I can work round this theme to suit my plan if I add enough adornment! Now getting postal deliveries every day of fabric, soutache braid, beads, sequins, more beetlewings (just in case!) and can't wait to get started on it! Think I'm going to be a busy girl over Christmas! I am about to start sewing leather for the first time for use in various projects. I'm just waiting on my sewing kit to arrive from the AetherBay (overstich wheels, awl, groover, thread needles etc.). Have already got various bits of leather together and have been busy reading numerous tutorials and watching countless videos on the subject. I think I now fully understand the techniques involved and just have to put them into practice (easier said than done). I'm planing on making a few pairs of goggles, an aviator style cap and straps for a steam powered jet pack. Along with anything else I can think of such as gloves. I've also got a big sheet of brass so am going to learn metal cutting and brazing too. Nothing like throwing oneself into the deep end to fire creativity. If it ain't broke then use it until it is. how on gods green earth did you get your hands on a corset house's pattern book ?!?!?!?!?!?!?!?!?? It's held in the archives at the Record Office for Leicestershire, Leicester & Rutland. They have the Symington Company's pattern book and some of the company's other records in their collection. A lovely lady named Cathy Hay visited the archive and arranged to take some photos. I pulled the pattern from one of those photos. She has a bit of a write-up on it here. I also have that pattern as my only bathing costume, but in blue and white with matching overknee sox. I didnt bother with the skirt though. I really like wearing it although in all honesty, i am not much of a one for actual swimming. So it's every hand to his rope or gun, quick's the word and sharp's the action. After all... Surprise is on our side. I'm not brave enough to wear it without the skirt! :-) I usually wear a 1950's style swimsuit for actual swimming although, somewhat ironically, I'm going to have to purchase a more basic bathing costume to wear under this if planning to get it wet, as my '50's one is a tad too bulky as under-attire. mistress magpie: What a gem!!! it's astounding really that these things survive, i shall be reading with anticipation! Aly..that's a great swimsuit. Sadly The Countess and I won't be partaking of the swimming at the New Year Party. I'd already had a plan in mind to make the Truly Victorian Parisian Trained skirt, adorned with real beetlewings. It's clearly too early..I read that as "Truly Victorian Parisian Trained skirt, adorned with real beatlewigs"
I know! It's a beautiful pattern, too-- I haven't even started drafting properly yet, but the more I work with this pattern the more I love it. New Year Party - the pool party is one of the main reasons for us going! :-) Rob's getting a male onepiece swimsuit for his christmas present, I shudder to think what scary a sight that will be! Impressed how even your mock-ups look so beautiful; can't wait to see further progress on this! I keep meaning to attempt to make a victorian corset; had a mostly successful stab at making an Elizabethan one last year but the additional curves and measurements required for a Victorian one scares me slightly! I'm taking a shot at one of these. A Berdan's Sharpshooters frock coat. My wife made the patterns for me and I start cutting in a few. but the devil take the nobility, says the Irish Volunteers! A good pattern, patience, and the tiniest pieces of tape. If you want to make a corset, there's a really excellent LiveJournal community and an article over at Foundations Revealed that should tell you everything you need to know. As far as the measurements, having a spare pare of hands around to help is a HUGE help. Yes, I am on that LJ comm and keep getting inspired by the wonderful creations posted on there. One day, I will be brave enough to give it a go! You could start off with a plastic-boned waspie. Minimum materials investment, but you'd still get to use most of the techniques you'd need for a full corset without the tricky measurements. Ah yes, I nearly forgot! i have made the Truly Victorian corselette. That came out quite well because I didn't have bust or hip measurements to worry about! 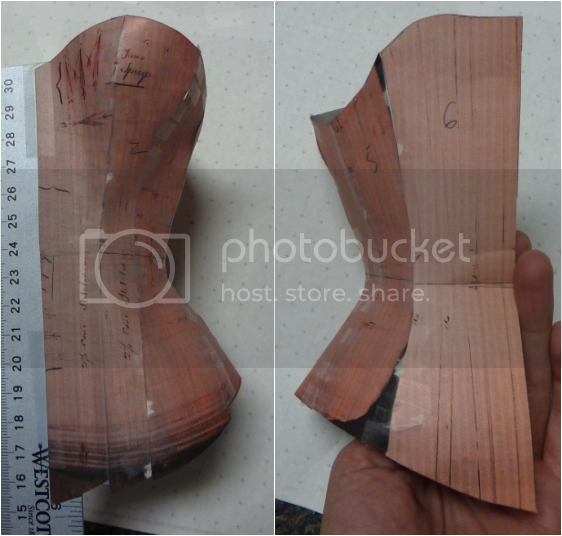 I did attempt a commercial company's "corset" pattern a few years back, that was a plastic boned one and the bust measurement came out so humungous that its still sitting in my fabric box waiting to be rescued. Secondhand, non-stretch jeans are great for mockups. The 'Mom jean' type, or mes work pants-- tightly woven, heavy cloth with no stretch materials blended in.